fresh food when the snow flies. ALMOST ANY STRUCTURE that is built to look like a solar greenhouse will work. That is to say, the solar greenhouse concept is so right that you can ignore (or not know) the fine points of solar design and still build a house with much less need for supplemental heat than a traditional greenhouse. But once you understand a few basic solar-greenhouse design ideas, you can easily put together a greenhouse that truly lives up to the label solar, and provides remarkable efficiency. 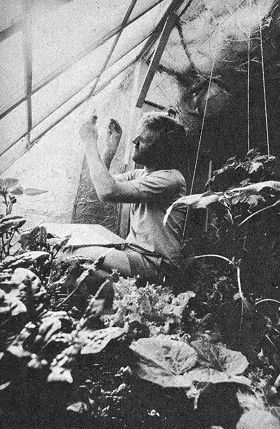 Dave MacKinnon, Ph.D., ORGANIC GARDENING greenhouse designer, has put it all together after three years of experimenting and has created a design formula that gardeners in any climate can follow. His newest solar greenhouse, which he has built and tested in Flagstaff, Arizona, epitomizes a good solar shape. It has produced food through two winters without requiring any outside heat source. Almost all the floor space is usable for growing beds because the energy storage is on the walls. And it uses a minimum of materials because the design, insulation and heat storage are in balance and arranged to complement each other. The best measure of a solar green house is the plant-growing environment it creates. When the building is skillfully made, you will get midspring soil and air temperatures in the depths of winter on sun power alone. Our experiences suggest that solar greenhouses can maintain that kind of environment in most parts of the country. ORGANIC GARDENING researchers have built two different greenhouses that have worked well despite unusual winter weather. The Flagstaff greenhouse performed well with much less sun than is considered normal, and the one at our Maxa-tawny, Pennsylvania, research center worked through the coldest winters in recorded meteorological history. In December and January we harvested enough salad greens every day for three or four people. Cold-hardy plants, all very rich in vitamins A and C, produce best. Escarole, lettuce, parsley, corn salad, chervil, chives and other salad herbs are dependable. So are kale, chard and chicory, which grow so thin and tender in the weak winter sun that they are best in salads too. In spring and fall the harvests are bigger. Succession plantings make heat-loving plants like tomatoes and cucumbers possible far beyond their normal seasons. Dave MacKinnon’s solar greenhouse greatly expands his crops of homegrown food. He picks salads every day through winter. Frost nips his outside garden early, so greenhouse protection has meant the first heavy-producing tomato plants he’s ever grown. 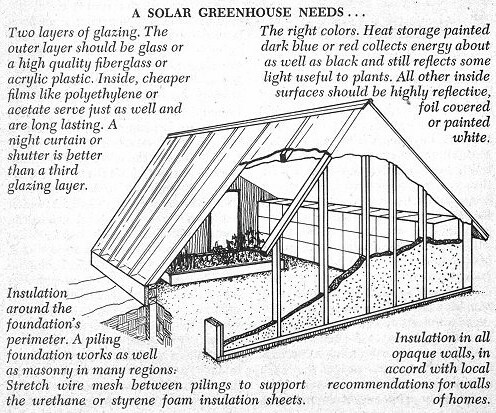 At the least, a solar greenhouse should have three features. One of the long walls should face due south rather than east or west. The south wall should have two layers of glazing. 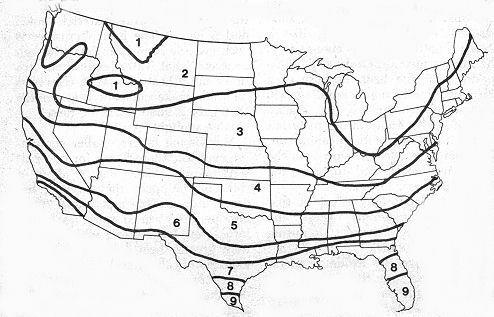 All the surfaces that don’t face south are insulated. But there’s a little more to it than that if the greenhouse is to live up to its solar potential. The new Flagstaff greenhouse is a perfect model. Dave MacKinnon says the greenhouse should be about twice as long (east to west) as it is wide. Accordingly, his Flagstaff greenhouse is 20 feet by 12 feet. The two-to-one relationship offsets the effect of the shade that the opaque east and west end walls create. The building thus captures more solar energy for each square foot of growing space. If the building is made much deeper than two to one — that is, closer to a square floor plan — the heat-storage material in back is shaded too much. These proportions are recommended for greenhouses everywhere. MacKinnon has learned another rule of thumb for sizing the energy-collecting south face properly, and has built it into the Flagstaff greenhouse. The peak should be made about as high as the building is wide (north to south). Heat-storing materials in the back of the greenhouse will then get the direct exposure to the sun they must have if the storage is to work efficiently. The slope of the north roof is an important feature of MacKinnon’s greenhouse, though the precise angle of slope is not critical. Sunlight which enters the greenhouse and strikes the aluminum-foil-covered roof (white paint works well too) is aimed back down to the growing beds. From the outside, the interior of the greenhouse looks almost black because very little light is bouncing back out to the viewer. If designed well, solar greenhouses with reflective walls can actually deliver up to a third more light to the plants in winter. In the traditional all-glass design, much of the light passes right on out the clear north roof and wall. Angles between 60 and 75 degrees for the north roof will work well in the United States and southern Canada. The slope of the sun-collecting south face might appear to be trickier to decide upon. The angle does affect how well the translucent face collects sunlight, but for greenhouses it’s not as critical as when setting up a compact solar-heating unit. Actually, a wide range of angles will work equally well at any given latitude. The simplest thing to do is to add 20 degrees to your latitude. A south face with that angle will give optimum performance in January. But if that particular angle proves hard to work with, go to a slightly shallower one, and you will be favoring solar collection in spring and fall. If you use 50 degrees rather than 60, which, for example, you may figure is your ideal, you still have sacrificed very little midwinter light. Given this leeway, other factors like convenient construction can help determine the south slope. The south face of the Flagstaff greenhouse was made steep all the way to the ground to shed snow quickly. That feature lets sunlight in sooner after storms. The Maxatawny greenhouse has a vertical glazed knee wall from which a shallow, clear roof slopes up to the peak. There is much less snow to worry about there, and this shape makes working in the front of the growing beds easier. The connection between heat-storing materials and insulation works like this. Without heat storage, solar greenhouses are something like a thermos bottle — all the energy is in the sun-warmed air. Drafts will quickly drain off the heat, because even the most tightly made building will have a fair amount of tiny cracks. Energy held within storing materials is not lost along with escaping air. The energy is released slowly as the greenhouse cools, and the building stays warm much longer. A no-less-important effect is that heat-storage materials keep the greenhouse from overheating during the day. We quickly learned that without storage the inside temperature can soar into the 80’s or 90’s on cold, bright days. That is quite hard on a winter greenhouse crop. With storage absorbing some of the incoming energy, the result is a milder daytime environment. The amount of heat storage for full solar heating seems enormous at first, but is manageable in practice. Both of MacKinnon’s greenhouses use about 1,000 gallons of water stacked vertically on the rear walls. That amounts to four gallons of water for each square foot of floor space. The best method we’ve found is to use rectangular five-gallon honey cans with a rust inhibitor added to the water. “Five-gallon honey cans make efficient heat-storage containers” says MacKinnon. They pack the maximum amount of water into a given space. Why do we rely so heavily on water? It is admittedly hard to work with because it tends to corrode containers and to leak. But water is about the best heat-storing material known and is cheap. The best alternative is rock (in any form from sand through concrete), but water holds about five times more heat. So water reservoirs on walls make compact heat storage that gets a good share of direct incoming sunlight. MacKinnon favors smaller containers over 55-gallon drums for two reasons. Drums leave empty about a third of the space they occupy, because they are big and round. They also permit warmed water to gather into a few large areas, which causes both greater heat losses and poorer collection in those areas. Smaller containers keep the energy more evenly distributed. On the other hand, the large barrels are certainly worth using if they can be had cheaply. We’ve also used translucent plastic cider jugs filled with water dyed black, and have heard reports of success with beverage cans sealed with tape and stacked right-side-up. The amount of insulation that MacKinnon judges to be practical in various regions is roughly the same as local, energy-efficient recommendations for homes. If that seems lavish for a greenhouse, remember that homes get a lot of extra heat; the greenhouse is designed to get along with none. To me, the need for plenty of insulation is a reminder that people aren’t much different from plants in their requirement for warmth, among other things. To use less insulation, however, is to need more heat storage, which demands more space and money. Two other simple things are crucial to the success of our greenhouses. The earth below them is insulated to a little below frostline with plastic foam. And at night an insulating curtain is drawn over the clear south wall to reduce the high heat losses there. and of water for heat storage. the roof should be glazed. It pays to insulate the earth below the greenhouse because earth is a relatively poor insulator, contrary to a lot of lore. A few inches of most common insulators match the R-value of ten to 15 feet of earth. But earth is a good heat-storing material, lying somewhere between rock and water. So insulating around the perimeter builds heat storage into the structure while stopping steady heat losses to the ground outside. We checked the advantage of doing this at the Maxa-tawny site. Six inches below the surface, the insulated soil was in the 40’s in January and in the 50’s in February, while the ground outside was frozen solid several feet deep. The day comes when shuttering the glass or plastic face becomes practical despite the inconvenience of twice daily attention. Past a certain point, there’s no easier way to gain a few degrees inside. The south-facing glass loses a tremendous amount of heat compared to the other three-fourths of the building’s surface that is insulated. To add enough storage material to make up for what shutters can save would take too much room away from the plants. We’ve found that a good nighttime heat barrier for the window doesn’t have to be a great insulator, but it must be durable and easy to maneuver, since it will get heavy use. More important, the material should be reflective on the inside and fitted tightly at the edges to stop air flow. A reflective material (aluminum paint or foil) will block all escaping radiant energy. Combined with an airtight seal, that seems to do plenty for me greenhouse. Beyond that, any insulating value you can build into the curtain is so much the better. The muscle power it takes to raise and lower the heat-trapping curtain is the only non-solar energy a well-designed greenhouse needs. Without a doubt, a thin, aluminized fabric which is operated by ropes or a pulley is the cheapest system to make and work with. The best one Dave MacKinnon tried was made of aluminum foil glued to one side of parachute fabric. That curtain lasted two years before needing repairs. 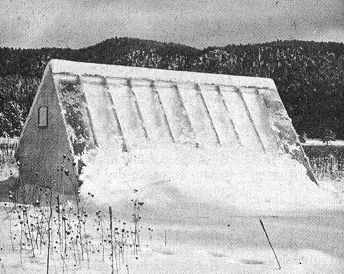 The third winter at Maxatawny we used a shutter system that could hardly be bettered for stopping heat. 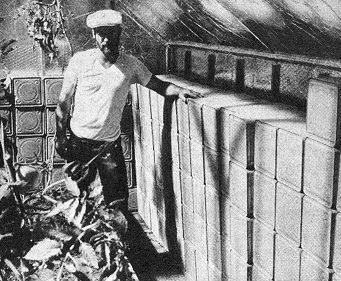 Panels of one-inch urethane foam, aluminized on one side, were held in place with wooden battens. We kept them in an air-lock entrance room that doubled for storing tools and gardening supplies. The only drawback to the foam is that it is expensive. Any exposed foam surfaces should be painted to waterproof the material against condensation that accumulates on the glazing. Those are the basics of a solar greenhouse: the sun-catching design, strategically placed insulation, and heat storage. Together they make a cool-weather garden possible even in Northern states. In ours the air inside has averaged 42 degrees higher than outside and between 45 and 55 degrees F. in the soil throughout the winter. Many vegetables will thrive in that temperature range. There’s a lot to be learned about cool greenhouse vegetable culture. The most important trick we’ve discovered is using the right growing container. Traditional greenhouse wisdom recommends pots on waist-high benches — easy to reach and easy to isolate diseases and pests. But continuous temperature recordings in the soil pots showed that the temperature in the root zone changed right along with the air temperature, because the exposed surface of a pot is so large. There were large swings every day, extremes that plant roots aren’t used to. So we switched to two large beds 18 inches deep that cover the greenhouse floor. They held the root zone to a 10-degree daily change which is natural, and also made a greater heat-storing mass. Beds have many other advantages. Roots have more room to forage for water and nutrients. The environment becomes a better one for natural predators like spiders. Because the soil in beds holds a large amount of organic matter, they also become an important source of carbon dioxide. Plants in a sunny, airtight greenhouse can use up all the available carbon dioxide in a few hours. can be constructed now for less than the finest energy-wasting glass house, and will be tailored to match your local climate. In the far North, where solar greenhouses will be the most expensive to build, they will yield the greatest expansion of the gardening season. Even in southerly Flagstaff, Dave MacKin-non reports that his solar greenhouse has made possible his first really good tomato crops, so dry and short is the growing season there. Properly made and maintained, a solar greenhouse should outlast its builder. The materials are all durable or renewable. House-attached greenhouses are even cheaper to build. As you plan your solar greenhouse, you should think first of this kind for many reasons. Attached greenhouses have about a third less surface area for the same floor space as a freestanding one. Thus construction costs are lower, and less heat is lost at night. Attached solar greenhouses are the most efficient hot-air solar collectors known. High and low vents that open into the home through the common wall exchange solar-heated greenhouse air for cool air at floor level from the house. At night, the house can return some of the heat to the greenhouse. All the design principles for solar greenhouses apply to the attached greenhouse, except they may need less heat storage. The only requirement is a suitable spot facing south that is unshaded in winter. Looking only at the money, it’s obvious that a durable solar greenhouse, attached or freestanding, will repay its cost. Compared to conventional all-glass models the fuel savings alone will pay for its construction in three to four years in the North. And they make you independent of an unhealthy agriculture and the transportation system it depends upon for fresh vegetables to tide you through winter. That’s why we recommend so strongly that you build one if you can.